Matteo Ricci, SJ (October 6, 1552 – May 11, 1610; ; courtesy name: ) was an Italian Jesuit priest, and one of the founding figures of the Jesuit China Mission, as it existed in the 17th-18th centuries. Matteo Ricci was born in 1552 in Macerata , today a city in the Italian region of Marche and then part of the Papal States . Ricci started learning theology and law in a Roman Jesuits' school. He entered the congregation in 1571, and in 1577, he filed an application to be a member of a missionary expedition to India, and his journey began in March 1578 from Lisbon , Portugal. He arrived in Goa , a Portuguese Colony, in September 1578, and four years later he was dispatched to China. In August 1582, Ricci arrived at Macao , a Portuguese trading post on the South China Sea coast. At the time, Christian missionary activity in China was almost exclusively limited to Macao, where a certain number of the local Chinese people, who converted to Christianity, were expected to live in Portuguese ways, and, until 1579, no one among the Christian missionaries there would even seriously learn Chinese language. It was only in July 1579 (just three years before Ricci's arrival) that Michele Ruggieri, invited by Alessandro Valignano, arrived from Portuguese India to seriously apply himself to the study of Chinese and preparing for spreading the Jesuits' missionary work from Macao into Mainland China. Once in Macau, 1582, Ricci started learning the Chinese language and customs in Macao - the beginning of a long project that, eventually, made him one of the first Western scholars to master Chinese script and Classical Chinese. Together with Ruggieri, Ricci traveled a number of times to Guandong's major cities, Guangzhou and Zhaoqing (then, residence of the Viceroy of Guangdong and Guangxi), in order to find a way to establish a permanent Jesuit mission house outside Macau. In 1583 Ricci and Ruggieri obtained permission to settle in Zhaoqing . They moved there after receiving an invitation from the governor of Zhaoqing at the time, Wang Pan, who had heard of Ricci's skill as a mathematician/cartographer. Ricci stayed in Zhaoqing from 1583 to 1589 before having to leave after a new viceroy decided to expel him. It was in Zhaoqing, in 1584, that Ricci composed the first European-style map of the world in Chinese. It is thought that during this time (1583-88) Ricci, together with Michele Ruggieri, compiled their Portuguese-Chinese dictionary - the first ever European-Chinese dictionary, for which they developed a consistent system for transcribing Chinese words in Latin alphabet. Unfortunately, the manuscript was misplaced in the Jesuit Archives in Rome, and not re-discovered until 1934. This dictionary was finally published in 2001. There is now a memorial plaque in Zhaoqing to commemorate his six-year stay there as well as a building set up as a "Ricci Memorial Centre", although the building itself does not date back to the time of the priest as it was built as recently as the 1860s. Expelled from Zhaoqing in 1589, Ricci managed to obtain permission to relocate to Shaoguan (Shaozhou, in Ricci's account) in the north of the province, and reestablish his mission there. Further travels in China saw Ricci reach Nanjing and Nanchang in 1595. In August 1597, Alessandro Valignano (1539-1606), his superior, appointed him as Major Superior of the mission in China, with the rank and powers of a Provincial, a charge that he fulfilled until his death. He moved to Tongzhou (a port for Beijing) in 1598 and then first reached Beijing on the 7th September 1598. However, because of a Korean/Japanese war at the time, Ricci could not reach the Imperial Palace. After waiting for two months he left Beijing first for Nanjing and also stopped at Suzhou in Jiangsu Province. During the winter of 1598, Ricci, with the help of his Jesuit colleague Lazzaro Cattaneo, compiled another Chinese-Portuguese dictionary, in which tones of the romanized Chinese syllables were indicated with diacritical marks. This work has been lost, and, unlike Ricci's and Ruggieri's earlier Portuguese-Chinese dictionary, has never been found. In 1601 Ricci returned to Beijing, accompanied by the Spanish Jesuit Diego de Pantoja. The two Jesuits were not initially granted an audience with the Emperor of China but, after they presented the Emperor with a chiming clock, Ricci was finally allowed to present himself at the Imperial court of the Wanli Emperor, thus becoming the first Westerner to be invited into the Forbidden City . Although Ricci was given free access to the Forbidden City, he never met the reclusive Wanli Emperor; however, Wanli did grant him patronage by allotting to Ricci a generous stipend that helped the Jesuits in China. Once established in Beijing, Ricci was able to meet important officials and leading members of the Beijing cultural scene, and convert a number of them to Christianity. One conversion, which he called "extraordinary", occurred in 1602, when a decorated veteran of the Korean War and a well-known astrologer and feng shui expert Li Yingshi became Catholic and provided the Jesuits with a wealth of information useful in debating with "heathens". Ricci was the first Westerner to learn about the Kaifeng Jews. He was personally contacted by a member of the Jewish community visiting in Beijing in 1605. Ricci never personally visited the community in Kaifeng , Henan Province, but he did send a junior missionary there three years later in 1608, which was the first of many such missions commissioned by the church. In fact, the elderly Chief Rabbi of the Jews was ready to cede his power to Ricci, as long as he gave up eating pork, but he never accepted the position. Ricci lived on in China until the end of his life. He died in Beijing on May 11, 1610 at the age of 58. According to the code of the Ming Dynasty, foreigners who died in China had to be buried in Macao. The Jesuits made a special plea to the court, requesting a burial plot in Beijing in view of Ricci's contributions to China. Emperor Wanli of the Ming Dynasty granted his permission and designated a Buddhist temple for the purpose. In October of 1610, the Jesuit Father's remains were transferred to the tomb. The tombs of Ferdinand Verbiest, Johann Adam Schall von Bell, and other missionaries are also in the same location, which became known as the Zhalan cemetery ( ) and is now on the campus the Beijing Administrative College (located at 6 Chegongzhuang Road, Xicheng District, ). Matteo Ricci was succeeded as Superior General of the China mission by Nicolò Longobardo in 1610, who entrusted another Jesuit, Nicolas Trigault, with the job of expanding and editing, as well as translating into Latin, of Ricci's papers that were found in his office after his death. The work was first published in 1615 in Augsburg as De Christiana expeditione apud Sinas, and soon was translated to a number of other European languages. Painting of Matteo Ricci in which he was depicted as wearing "Chinese scholar" robe, dated 1611. Ricci could speak Chinese as well as read and write classical Chinese, the literary language of scholars and officials. Added to this he was known for his appreciation of Chinese culture. During his research he discovered that, in contrast to the cultures of South Asia, Chinese culture was strongly intertwined with Confucian values and therefore decided to use existing Chinese concepts to explain Christianity. He refused to explain the Catholic faith as something foreign or new, instead, he confirmed that the Chinese culture and people always believed in God, and that Christianity is simply the most perfect manifestation of their faith. Thus the Chinese Lord of Heaven is identical with Jesus Christ. He supported Chinese traditions by agreeing with the veneration of the dead. Dominican and Franciscan missionaries felt he went too far in accommodation and convinced the Vatican to outlaw Ricci’s approach. Similarly to developments in India, the identification of European culture with Christianity led to the virtual end of Catholic missions in China. Later discovering that Confucian thought was dominant in Ming Dynasty , Ricci became the first to translate the Confucian classics into a western language, Latin, with assistance from the scholar Xu Guangqi. Ricci also met a Korean emissary to China, Yi Su-gwang. 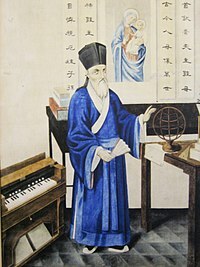 He taught Yi Su-gwang the basic tenets of Catholicism and transmitted western knowledge to him, giving Yi Su-gwang several books from the west which were incorporated in Jibong yuseol, which was the first Korean language encyclopedia. Ricci's transmission of western knowledge to Yi Su-gwang influenced and helped shape the foundation of the Silhak movement in Korea. Matteo Ricci's grave in the courtyard of the Communist Party School in Beijing. Ricci Institute for Chinese-Western Cultural History at the University of San Francisco . In the run-up to the 400th anniversary of Ricci's death, the Vatican is hosting a major exhibit dedicated to his life. At least one Catholic bishop - Claudio Giuliodori from Ricci's hometown, Macerata - has mentioned that the possibility of the Jesuit's beatification is considered by the church authorities. Map of the Far East by Matteo Ricci in 1602. Zhang Dai (1597 - 1689) Chinese scholar who published a criticism of Ricci's works in China, On Matteo Ricco. Yves Camus, "Jesuits’ Journeys in Chinese Studies"
Bowman, John S. (2000). Columbia Chronologies of Asian history and Culture, p. 212. Dehergne, Joseph, S.J. (1973). Répertoire des Jésuites de Chine de 1552 à 1800. Institutum Historicum S.I., Roma. A discourse of the Kingdome of China, taken out of Ricius and Trigautius, containing the countrey, people, government, religion, rites, sects, characters, studies, arts, acts; and a Map of China added, drawne out of one there made with Annotations for the understanding thereof (an early English translation of excerpts from De Christiana expeditione) in Purchas his Pilgrimes (1625). Can be found in the full text of "Hakluytus posthumus" on archive.org. The book also appears on Google Books, but only in snippet view.